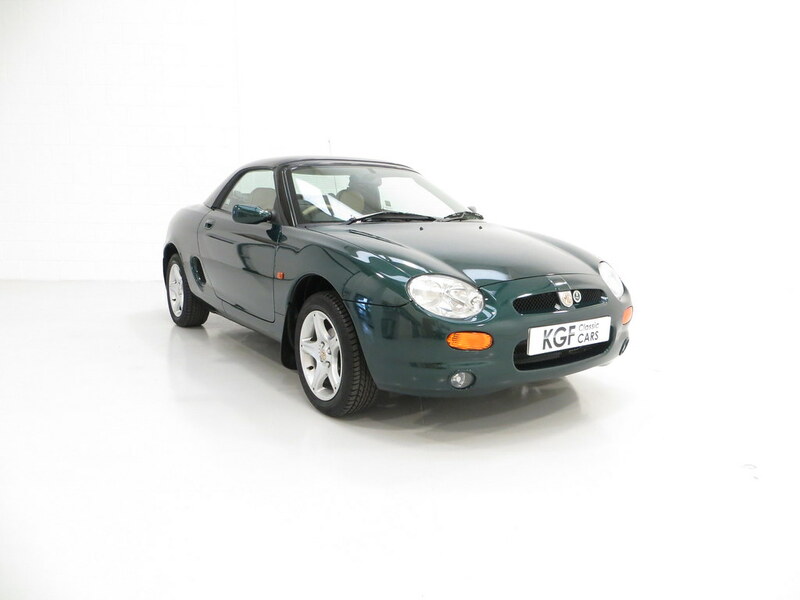 An astonishing one owner MGF 1.8i VVC with just 5,136 miles from new. Reinforced body structure, door side intrusion beams, high tensile tubes in A pillars, fuel tank cage, drivers airbag, body-colour bumpers, mirrors and door handles, tinted glass, bright sill finishers, halogen headlamps, hood cover, high level brake lamp, remote central locking, perimetric and volumetric alarm system, speed sensitive power steering, electric windows, oil and coolant temperature gauge, drop down bin and cup holders. 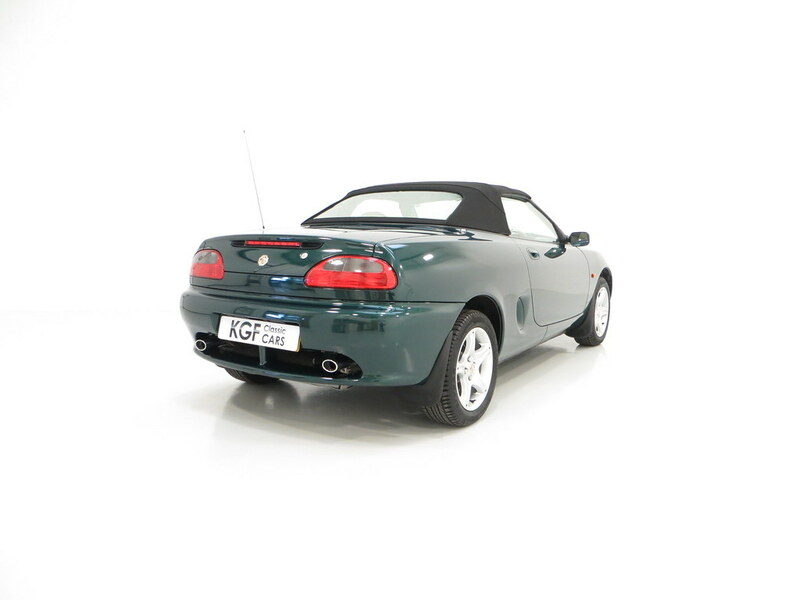 Factory Options: Hardtop with heated rear screen, passenger airbag, front fog lights. Dealership accessories: MG fitted mud flaps, MG branded valve caps, tailored hardtop cover, dark walnut veneer facia kit, real wood/alloy gear knob, MG carpet mats, MG baseball cap. 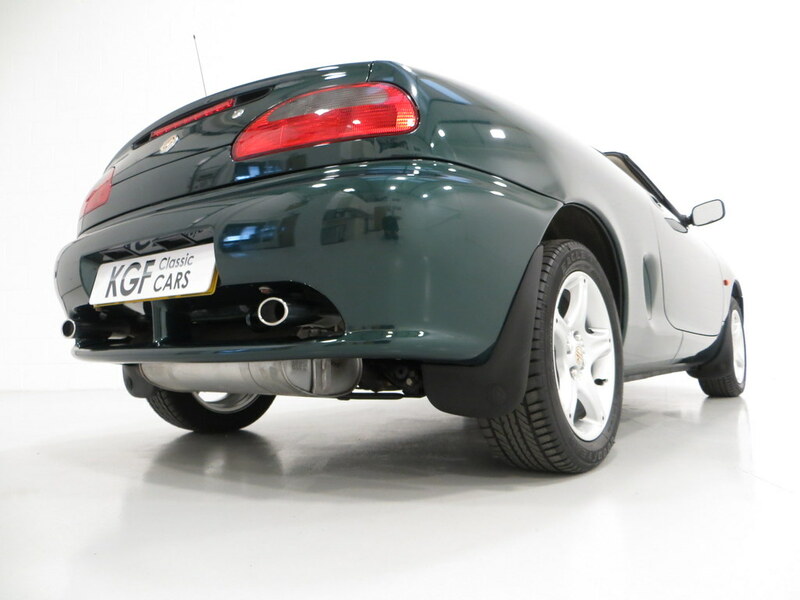 This incredible MGF is finished in classic British Racing Green, (Code HAM), and boasts a deep shine from garaged storage and a very low 5,136 miles. 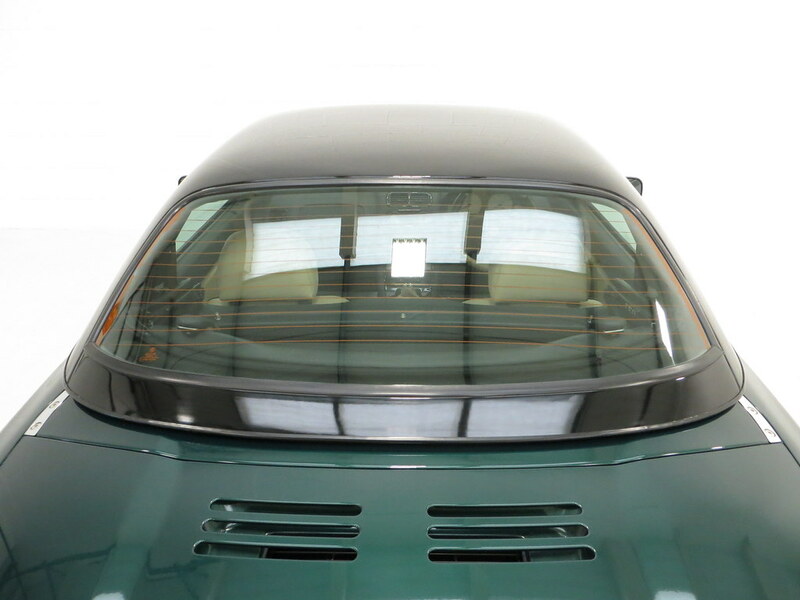 The factory black hardtop was a cost option at £1,125 and although unmarked the headlining has dropped slightly. The woven acrylic fabric hood is as new and the plastic screen completely clear. Being an early example the car is fitted with orange indicator lenses and has optional front fog lights. 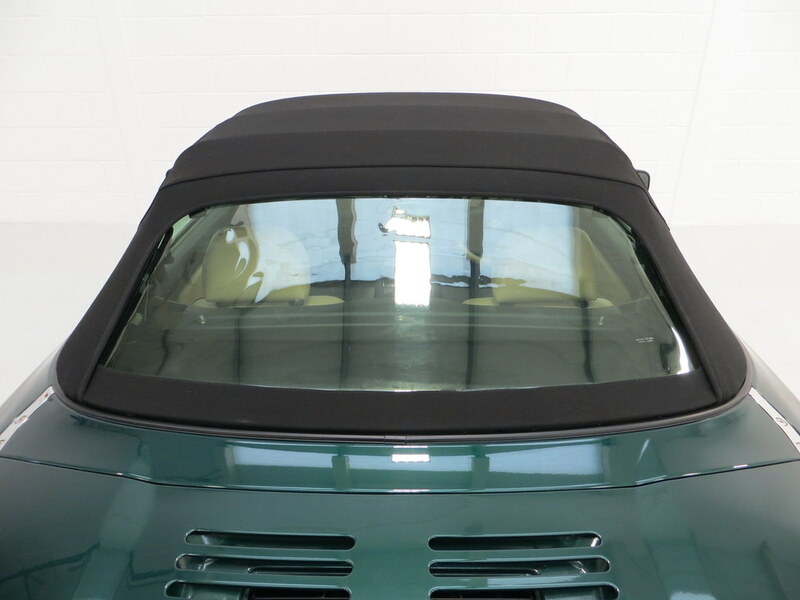 All panels are straight and display excellent shut lines and fit and even the boot lid is flush, so often raised due to the incorrect fitting of the tonneau cover. The underside is remarkable displaying every factory marking and easily a contender for concours. 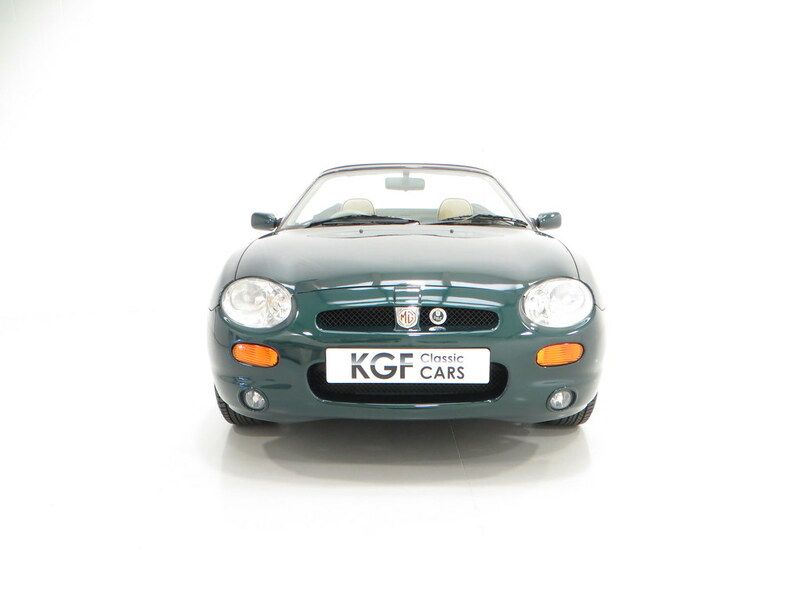 All trim is unmarked and a removable MGF Register badge is fitted to the front grille. This example will satisfy the most fastidious fanatic and is probably the best surviving example anywhere. 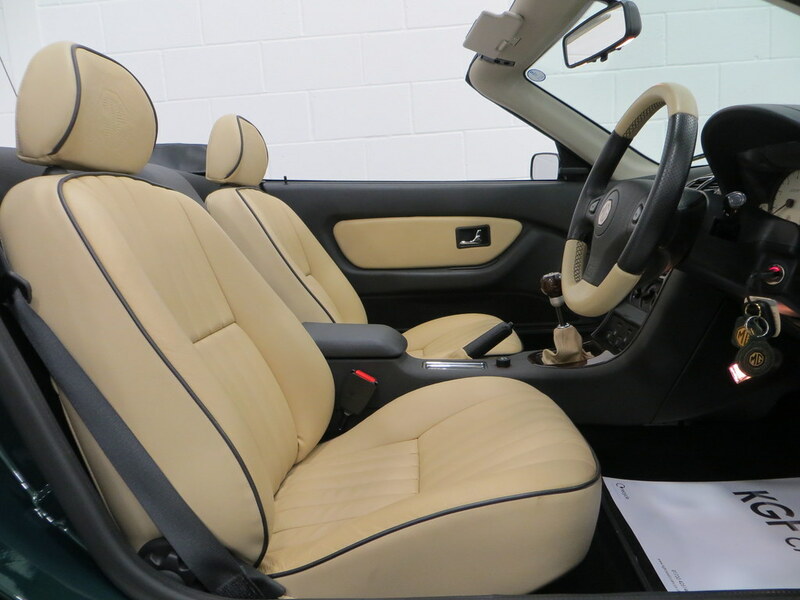 Specified with luxurious and cost optional Beige leather, (Code SMK), the interior of this cossetted example is as new. 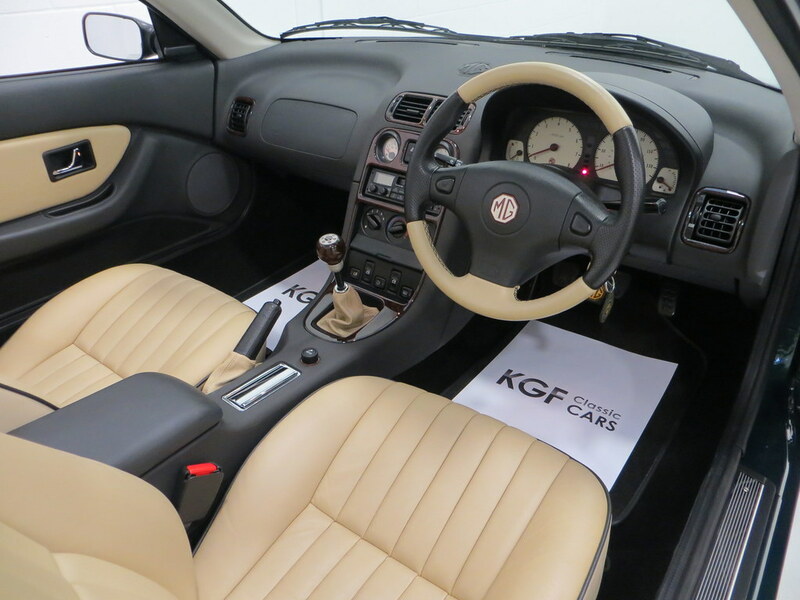 Wonderful and genuine MG accessories remain fitted such as the dark walnut veneer facia kit and real wood/alloy gear knob complementing the leather perfectly. 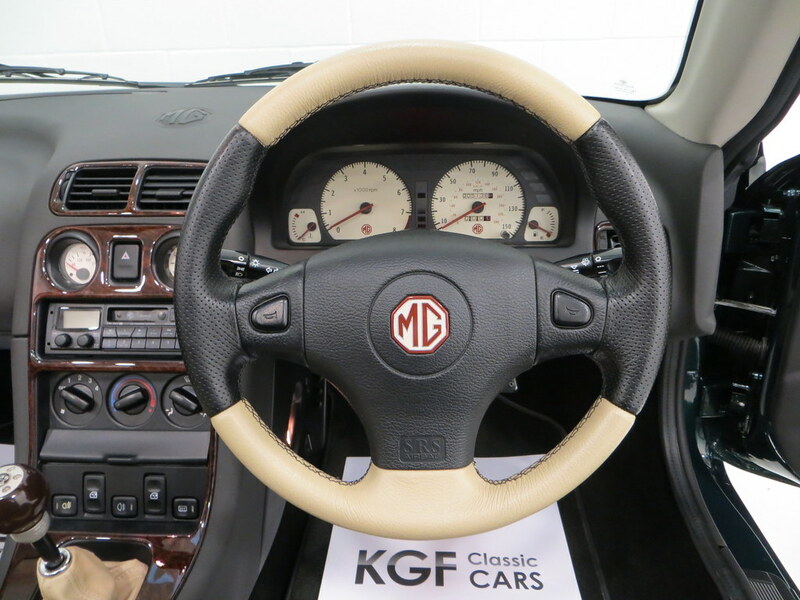 The cut pile carpets have tailored MG velour mats covering them and the ivory-coloured dials of the instrument binnacle with the MG logos recall traditional MG design cues and were only fitted to the early cars. 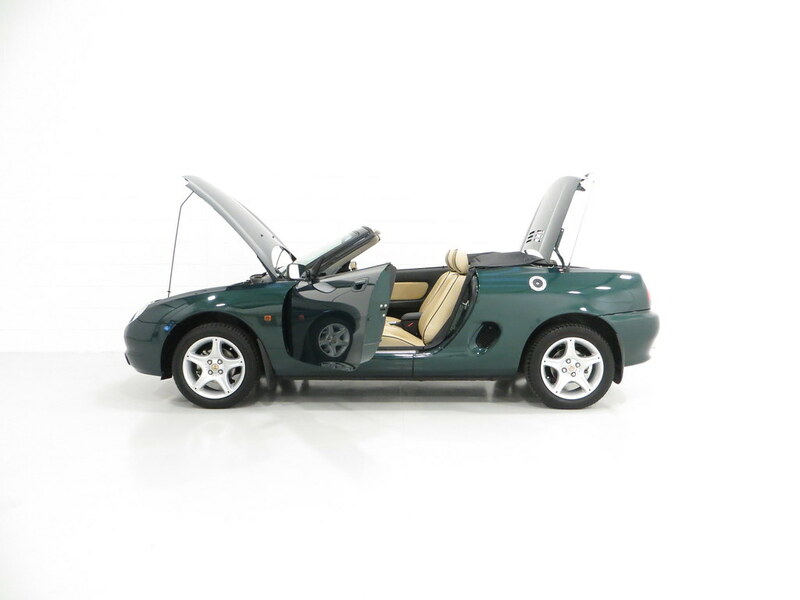 The 1.8i VVC model is fitted with the colour-keyed leather trimmed steering wheel in perfect condition and the knowledgeable will note the red line at 7250 rpm on the tachometer. Both front and rear luggage areas are surprisingly spacious and spotless with the front housing an unused spare wheel and jack and even shows all factory PDI paint dabs! MG museum quality in all respects. The desirable four-cylinder 1796cc VVC, (Variable Valve Control), engine produces 143bhp enabling a top speed of 130mph and 0-60 in just 7.0 seconds. The light weight body, mid-mounted engine and rear wheel drive configuration possesses all the correct sports car credentials to ensure optimum driver delight. The Hydragas suspension has recently been set to the manufacturers ride height of 368mm. A documented cambelt and water pump change was carried out in February 2019. The short throw sports ratio five speed gearbox completes the package. The original and unrestored 15inch five-spoke style alloy wheels with the MG logo are in pristine condition with no damage whatsoever and the only owner from new even paid extra to have genuine MG branded valve caps! Factory fitted Goodyear Eagle Touring tyres of size 185/55 R15 tyres up front and 205/50 R15 at the rear will please originality seekers and while tread and rubber condition are excellent it is recommended to renew them for safety reasons if the car is to be used. 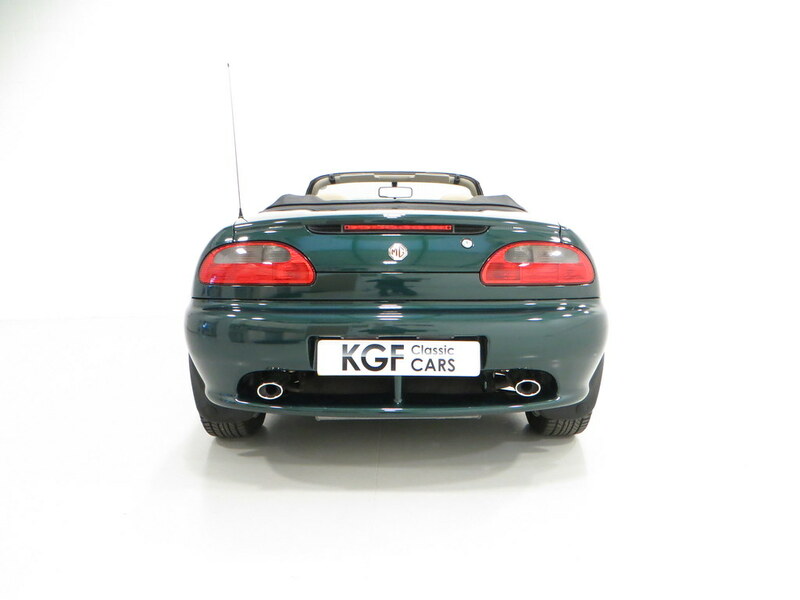 Ventilated front discs and solid rear discs with electronic anti-lock braking fitted as standard on the MGF 1.8i VVC offer positive straight-line stopping power. 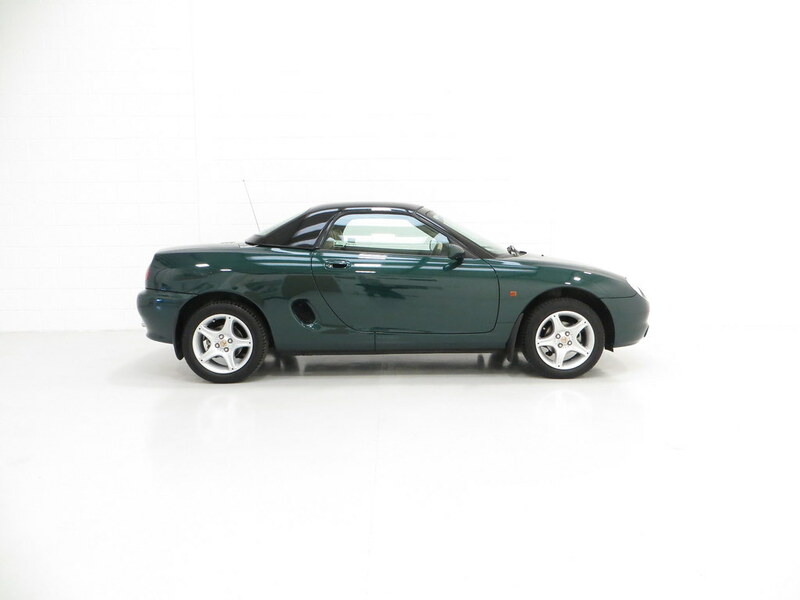 Purchased new by motoring fanatic Alistair McKillop who typically enjoys his collection of Lamborghini supercars, this cherished top specification MGF 1.8i VVC has covered an incredible 5,136 miles since new! 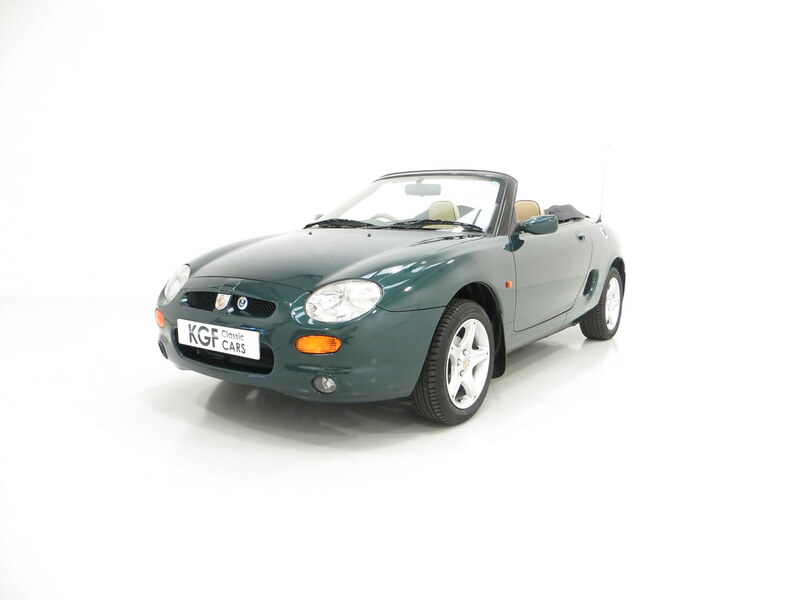 Frustrated with the poor service received from his local MG Dealer and price differential, Mr McKillop placed his order with MG Main Dealers, Royal Motors in Germany. 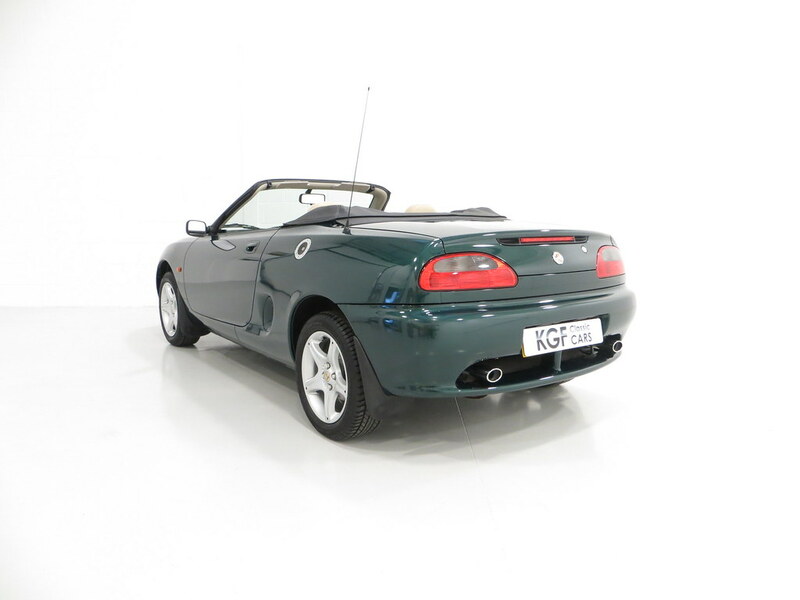 Delivered new to exact UK specification and registered on the 1st July 1998 this car can only be described as Condition One in all areas. Two lever arch folders await the new owner neatly filed and make fascinating reading containing virtually every MGF brochure, service document and purchase correspondence. In February 2019 the vehicle underwent a full service to include both cam belts and water pump to supplement the five other entries in the service book. All handbooks in the MG leather folder are present and two sets of keys and remotes remain. Both key sets still have still have the engine immobiliser cards and key number tags attached! A cherished private ‘MGF’ registration number is included with the sale to what must be one of the best surviving examples made available for a lucky new custodian.